Essay Contest Winners Claim Prizes – Three high school students claimed prizes at the awards ceremony for the 6th Annual FirstCare Medical Plan Autism Awareness Essay Contest. Pictured from left to right are: Marcia Newball, Executive Director, REACH Bahamas; Shenae Davis, REACH Representative; Alexandria Rolle, Grand Prize Winner; Aretha McDonald, First Runner-Up; Corinna Neely, President, FirstCare Medical Plan; Vanria Jack, Education Officer, Ministry of Education, Science & Technology; Marcellus Taylor, Acting Director of Education, Ministry of Education, Science & Technology. Not pictured is Second Runner Up, Joseph Townsend, 11th grade student of Sir Jack Hayward High School in Grand Bahama who could not attend this year’s ceremony. 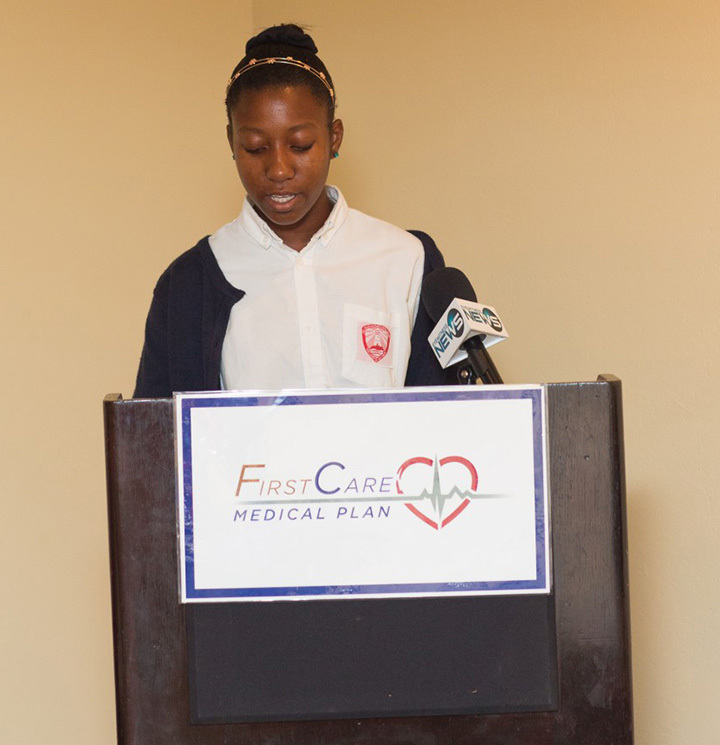 Nassau, Bahamas – FirstCare Medical Plan, The Ministry of Education and REACH Bahamas announced the winners of the 6th Annual Autism Awareness Essay Contest at an awards ceremony held yesterday. 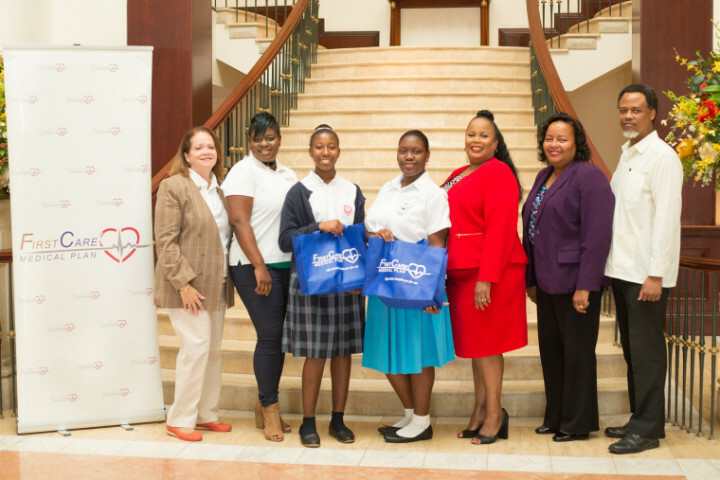 Entries were received from students throughout The Bahamas, including Grand Bahama. The essay contest is held every April, internationally recognized as Autism Awareness Month. Autism remains the most rapidly growing critical developmental disability within The Bahamas. Grand Prize Winner Alexandria Rolle, an eleventh-grade student at St. Augustine’s College, reciting her winning essay. A panel of judges from The Ministry of Education and REACH poured over the essay submissions to select the three winners. The winners were awarded cash and prizes valued at more than $2,000. Alexandria Rolle, an eleventh grade student at St. Augustine’s College, was named the grand prize winner. Rolle received a $300 cheque from FirstCare Medical Plan, a tablet courtesy of Custom Computers, and gift certificates from The Shoe Village, John Bull and AML Foods Ltd.
peers.” Rolle also proposed that the Education Act be adjusted to include mandatory lessons on Autism for all students at the primary and junior high school levels, so that “students would learn what Autism is and how others should treat those with the disability”. First runner-up, Aretha McDonald, an eleventh grade student at Aquinas College, and second runner-up, Joseph Townsend, an eleventh grade student at Sir Jack Hayward High School in Grand Bahama, both received a $200 cheque from FirstCare Medical Plan, as well as gift certificates from The Shoe Village and AML Foods Ltd.
FirstCare Medical Plan has pledged to continue their work with REACH and to host the Autism Awareness Essay contest for many years to come.